The first written record of chocolate mousse is from 1892. If you like chocolate mousse, you can claim that you have quite the taste buds for all things antique. I have never made chocolate mousse prior to trying this recipe and then I made it three times within the next two weeks. Mostly because I bought the pound plus chocolate bar from Trader Joe's (it's only $5) and a huge jug of heavy whipping cream from Costco for this recipe. I had so much leftover ingredients that I decided to make one more batch. And then another. 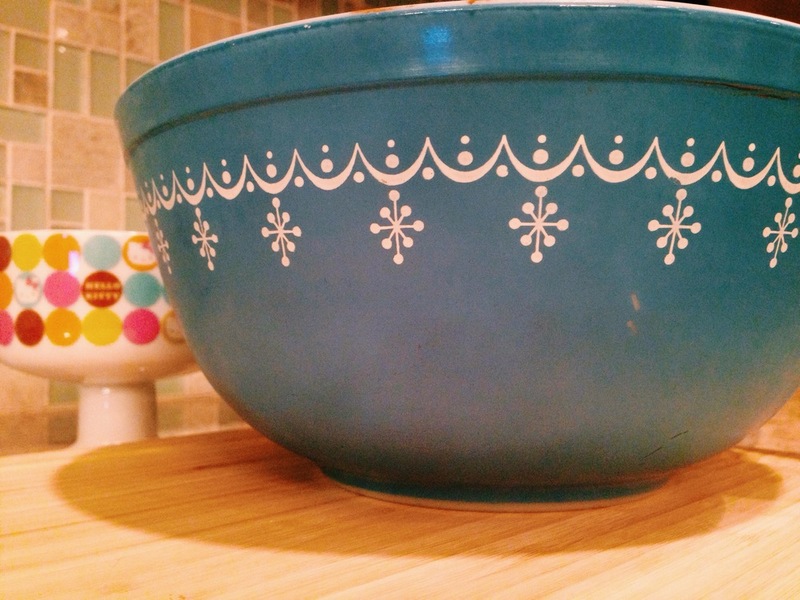 I decided to make chocolate mousse with my Snowflake Blue #403 2.5 quart Pyrex mixing bowl I recently found at Goodwill in Houston. It greeted me as I walked through the front entrance. I was pretty happy since I never find Pyrex out in the wild in Houston. The best place for Pyrex I've seen so far is at the Old Blue House Antiques. The lady behind the counter (who I think is the owner) said she's known as the Pyrex queen. There's a pretty sizable collection and there are items I've only seen online and never in real life. So if there's a hard to find piece you're looking for - it may very well be at this store. Although, it's a bit pricey. I also came across the cutest Hello Kitty dessert bowls at Rice Brothers Coffee Co. It's a combined coffee shop and thrift shop owned by two brothers. They are sharing the space so they can each go after their dreams. The proceeds of the thrift store goes towards a job training program for homeless men. I love going there to see what new things are in the store and find that it's clean, fun and welcoming. Make this and let me know how yours turn out! Combine the chocolate, cocoa powder, espresso powder, water, and optional brandy in a medium heatproof bowl. Place over a saucepan filled with 1 inch of gently simmering water, and stir frequently until the chocolate is melted and the mixture is smooth. (I just use the microwave and do this in 25 second intervals - make sure it doesn't boil - and stir until the chocolate is melted) Remove from the heat. In another medium bowl (I used my Pyrex bowl for this step), combine the egg yolks, 1 ½ teaspoons sugar, and salt. Whisk until the mixture lightens to a pale yellow color and thickens slightly, about 30 seconds. Pour the melted chocolate mixture into the egg mixture, and whisk until combined. Set aside for about 5 minutes, until just warmer than room temperature. In another medium mixing bowl, beat the egg whites on medium-low speed until frothy (I use a hand mixer). Add the remaining 1 ½ teaspoons sugar, and beat until soft peaks form when the whisk is lifted. Using the whisk, stir about ¼ of the beaten egg whites into the chocolate mixture, to lighten it. Then, using a rubber spatula, gently fold in the remaining egg whites until only a few white streaks remain. Wipe clean the bowl from the previous step and whip the heavy cream at medium speed until it begins to thicken. Increase the speed to high, and whip until soft peaks form when the whisk is lifted. Using a rubber spatula, fold the whipped cream into the mousse until no white streaks remain. Spoon into 6 to 8 individual serving dishes - Cover with plastic wrap, and refrigerate until firm, at least 2 hours and up to 24 hours.